KappaGen is a tool within the StreamElements Overlay Manager that is guaranteed to increase user engagement. Watch the video to learn more about KappaGen's features and capabilities. All KappaGen settings are also listed below. Still have questions? We are here for you on our Discord channel. 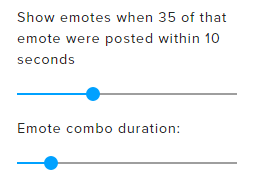 The duration an emote is displayed on your screen.